Ever since the last Talisman album, Cats & Dogs, lead vocalist Jeff Scott Soto has been a busy man. The man has been involved with numerous projects and bands in his career, so that should be no surprise. However, his latest "journey" has lead to what Jeff certainly considers an opportunity of a lifetime. Jeff has released a solo album (the excellent Lost in the Translation) and recorded an album with Journey guitarist Neal Schon under the moniker Soul Sirkus in the last three years. This collaboration with Neal Schon lead to Jeff singing on the last half of the Journey tour of 2006. Vocalist Steve Augeri came down with a serious throat condition in the middle of that tour that to this day leaves his singing career in jeopardy. Plans for a 2007 Journey tour have been announced, and Jeff Scott Soto is penned as the lead vocalist. In fact, promo pictures of the band now show Soto alongside the other four members of the band. With that said, the return of Steve Augeri to the band must certainly be in doubt at this point. At any rate, Jeff is very much still the lead vocalist for his long time band, Talisman, who have just released their seventh album. In terms of melodic hard rock, there are few figures more reliable than Jeff Scott Soto. Whether it be Rising Force, Axel Rudi Pell, Eyes, Talisman, Humanimal, or the numerous other projects he has been involved in, the end result is always melodic hard rock of the highest quality. 7 sees the band return to its roots of their debut album and Genesis stylistically. The harder edge the found its way into the band's last album Cats & Dogs is gone in favor of a more melodic sound, and the funkiness of the Humanimal era of the band makes on a very brief appearance in the form of Succumb 2 My Desire. Aside from that, 7 is a hearty slab of melodic hard rock that will take you back to the late 80's and early 90's. Of course, the production and sound quality is much better than that, but the spirit of the music is very much aligned with that time period. I have to wonder if Jeff's involvement with Journey has something to do with the harder edge of Cats & Dogs suddenly falling by the wayside with this album. Jeff's latest solo album also has a harder edge in terms of riffing and guitar solos. Furthermore, the bass guitar was notched up a bit on both those albums, creating a modest melodic metal tinge to both albums' hard rock sound. 7 is a more polished and accessible album, something that seems to play into Jeff's involvement with Journey. Of course, Jeff's situation with Journey certainly must be a draw for Talisman right now. Hence, I can understand why Talisman might cut back on the metallic leanings in their sound, instead opting to let the hard rock and power AOR side of the band to really shine. At the end of it all, 7 is still very much a Talisman album for the entire duration, even if the sound of the band has shifted a bit over the past 3 years. Although the guitars aren't as hard hitting on this album as I expected after Cats & Dogs, 7 is a fantastic album that will certainly please all Talisman fans out there. Where the heavy guitars are more subdued for this album, a greater sense of melody and catchiness takes its place. Although these qualities can be found on any Talisman album, the guys really nail it on this album. Ranging anywhere from melodic hard rock anthems to power AOR and a couple ballads, each of the songs is memorable and loaded with emotion. Soto's emotional and gritty vocals are still in fine form, with this highly melodic music really showing off his voice. The band makes extensive use of harmony vocals during the chorus lines to really drive home the melodies. Again, the tried and true recipe that Talisman has been using over the years is again at work here. I guess that may be a problem for some, but Talisman are one of those bands like AC/DC, Manowar, or Primal Fear who have a become a master of their craft and don't necessarily need a new approach all the time to stay at the top of their game. 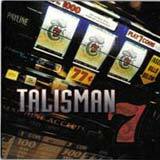 7 is another melodic hard rock album from Talisman that can be played start to finish without letting you down. From the ballads to the rockers, I am pleased with each track on this album. I do think a heavier edge could have helped here and there with the more uptempo tracks of the album, and the solos could have been a bit fiercer throughout. That does numb my enthusiasm a very small amount. However, I do think Talisman have delivered another dazzling album, even if it's not the bands heaviest. Each of the songs is able to stand up on its own, and that says a lot to me in terms of judging an album's worth.